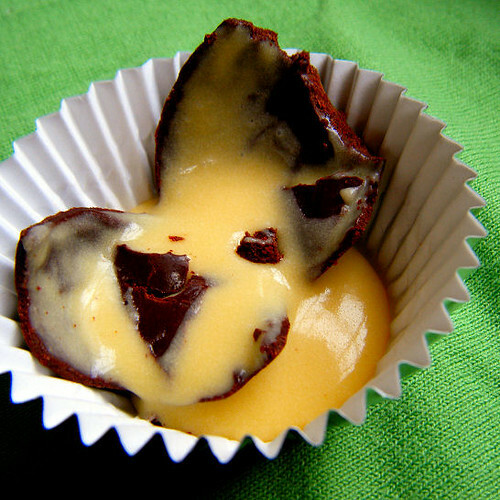 50 Comments on Healthy Homemade Creme Eggs… Move Over Cadbury! OMGosh, I love you! 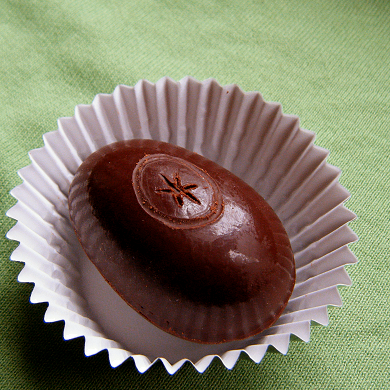 These were my very favorite Easter candy growing up, and just like you, they are the ONE thing I miss since changing my diet and re-training my tastebuds. 🙂 I can’t wait to try these! Where did you get your egg molds? Lauren, thank you! You never cease to amaze. You know, I never really liked the “real thing” but I am going to LOVE these. Thanks so much for all your hard delicious work!! Wow! You are a rock star–I didn’t know it could be done :D! Best Easter recipe I’ve seen yet! Absolutely AWESOME! I’m a huge creme egg fan but haven’t had one in years…this will enable me to enjoy them once again, Thanks so much! These look amazing! I used to love Cadbury eggs. Thanks so much for posting this fun recipe! One question, though — what is nonhydrogenated shortening? Do you mean vegetable shortening? I wouldn’t call that healthy. How about using coconut oil or palm oil shortening? Or lard? Also, is there a way to use real cream instead of powdered nonfat milk? I don’t think powdered nonfat milk is good for you. Very cool treat! I love the D.I.Y. version! Katie – Oh that’s no good! Hopefully you enjoy this alternative. I never thought of just looking at the craft store for molds, d’oh! Synesthetic – Thank you so much! Hope you enjoy the treats. It’s a pleasure. Sophie – You always leave the best comments, Sophie! Stef – Wonderful! Hope you enjoy. Nonfat powdered milk is the only way to make “milk” chocolate that does not melt all over your hand without causing the chocolate to seize. I had the same concern as you! Nonfat powdered milk contains only trace amounts of oxidized cholesterol (since it IS nonfat–this is the one instance where nonfat is good! ), and the two tablespoons of it required in this recipe is nothing to worry about IMO. Since the recipe is overall so healthy, it works for me. 😀 Thank you for visiting! Um, I LOVE LOVE LOVE this! 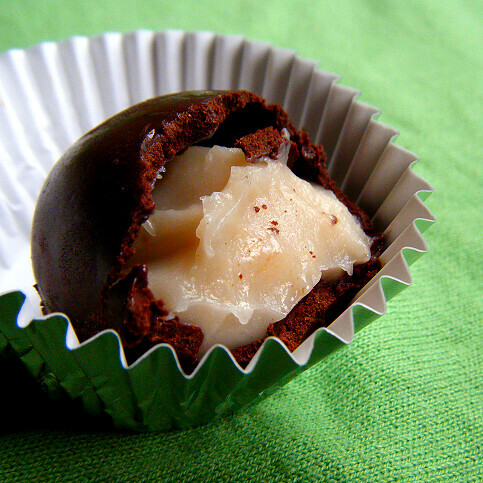 I’ve been working on making GF creme eggs of my own and now I have a recipe to work off of! Lovely! that is so cool! My husband was asking me if I could pick up some cadbury eggs this weekend and I refused, but I might have to try this as a special treat. Thanks so much, these look amazing! I don’t think we have shortening in the UK, do you think vegetable fat would work just as well? I am not going to lie; I’m effing amazed by these. I cannot tell you how amazing these look!! 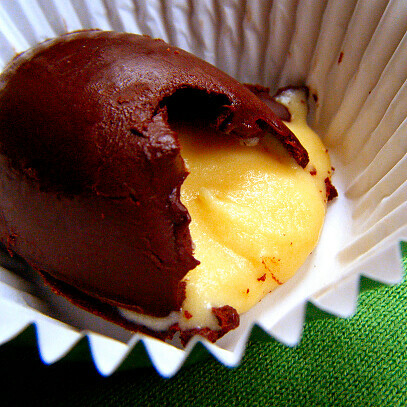 I am bookmarking this recipe and only hope I don’t have to wait until next Easter to try them!! Oh my Gosh! You. Are. Brilliant. These look so amazing. Thank you for creating and sharing this recipe! Woohoo! I can have Cadbury Creme Eggs again!! Honey isn’t vegan. Dairy free yes, but if youre going to post this as vegan maybe add an alternative? These look unbelievable. I agree, these look much better than Cadbury, I want some! Oh pleaze! If you want a Cadbury creme egg then for crying out loud have one. Eating healthy for 364 days of the year instead of 365 is not going to adversely affect health. Unless you have a medical condition which prohibits eating an empty carb once a year is not going to hurt. What does hurt though is Obsessive Compulsive Disorder which is clinically obvious for a few of you. Joan Levy, founding president of the Feingold Assn of Chicago. Its making my mouth water as usual. Keep it up, I love this blog. Dana – Hope you have success with it! Thanks. Marc – These are less sweet and better IMO! Enjoy. Jenny – Hope these worked out for you! Carol – As long as it is solid at room temp, it should work. Let me know how it goes! Nostalgic – Your comment made me smile! Ricki – Thanks for all of your advice. Love your blog. Liz – Thank you, and I hope these worked for ya. Ferret – I’m assuming agave would work, but I don’t advocate it’s use. Hope you find something that works for you! Nick – Thank you! That’s high praise. Kim – Thanks so much! Naomi – You always amaze me with your recipes. Thanks for the comment! Low Carb Diet Junkie – Thank you for stopping by! Hey nice blog…….When I looked the 1st picture, yummy I was feeling hungry then I read your recipe, then I made it for family and they were very happy for you. A-maz-ing. While it is true that it wont hurt me to eat an occasional 'bad' cadbury egg, how fun to have a great recipe for ones that wont leave me frantic for more!! Oh my. And a dairy free version so that I don't break out in hives this fine sugar-laden season? I do believe you've just made my week. 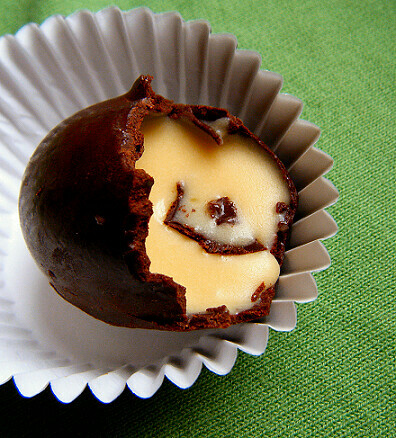 This recipe is making me think how cool it would be to use the egg mold to make peanut butter eggs like the Reese's they sell at Easter time. Love your blog. Glad to have found it. I know this is an old post, but it's so awesome and just what I needed! Are you able to post pics of the texture of the custard? I can't decide what 'coats the back of a wooden spoon' quite means. Hi Erena, it just means that the custard will thicken and leave a clear trail when you drag your finger through it on the spoon. It's not so fluid that the liquid will immediately fill in the trail your finger left. Also, you should be able to google "custard, coats a spoon" for a good photo of that. Thank you for the comment! These look soo great! such a great idea to make healthy versions, i would have never thought of this. O.o Oh… My… Gaw-! Brilliant. Simply brilliant. I know what I am making in April. Hope you got to try it, Krista. Thank you for sharing! hey…love your recipes…i have a question about the powdered milk for the chocolate chips…since it has alot of sugar couldn't you use heavy cream instead? Check out my http://d4s6h9dj2zx.com – reviews website! Check out this review webpage! Check out this review webpage..